Some businesses have promotions which give extra rewards and these rewards can be at a limited quantity or valid within a limited time only. Thus, providing option from Member WebApp could allow members to claim their desired rewards online with ease. Enable Claim button on Member Web App - If enabled, Reward can be claimed online via mobile phone or web browser. 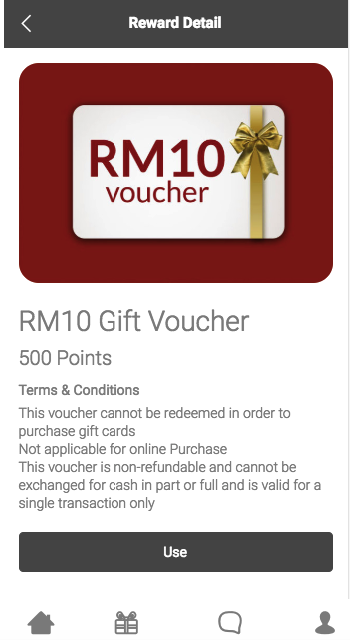 When a reward is claimed, points is deducted and the reward will be shown in "MyReward" page. Reward can be redeemed for use on StoreApp installed on tablet. This option allow members to "Reserve" their rewards and use it in-store when the visit the shop. Enable Use button on Member Web App - If enabled, Reward can be use online via mobile phone or web browser. This option apply suitably for online store, a code can be generated and visible to members upon redemption. Hence, given code can be apply during checkout from online store. This reduce operation step by skipping the "Claim" process. However, no generate of code can be applied and redeemed reward will be viewed in "History" tab. Once enabled, a passcode is prompted for staff verification in order to proceed with the member Web App rewards redemption. When activated, details on which staff performed or approved the rewards transaction will be listed. This feature is an alternate redemption option for your members if your premise isn't carrying/using the StoreApp. Members are still able to redeem their rewards even if StoreApp isn't able to connect to the Internet. This feature also allows members to make redemptions at your partnering store which doesn't carry the StoreApp.